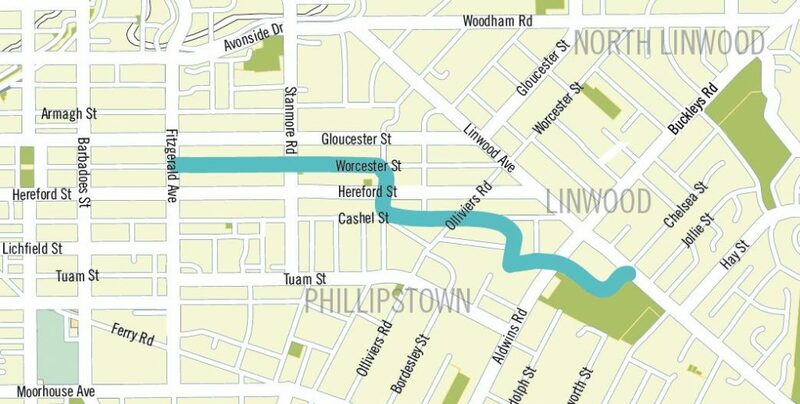 The Christchurch Major Cycleway projects are starting to gather a head of steam lately; first we saw the planned details for the Little River Link to the southwest, and soon I’ll tell you about another new route for consultation heading to the north. 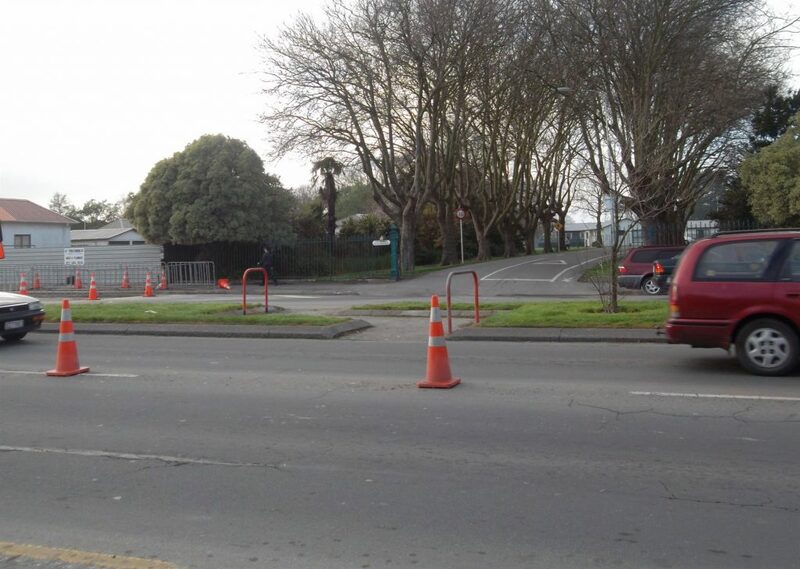 But today, let’s go east and look at the plans released for the Rapanui – Shag Rock Cycleway. The Rapanui – Shag Rock Cycleway, will ultimately extend from the Central City via Linwood out to the Ferrymead Bridge, where the Christchurch Coastal Pathway will then provide cycle access to Sumner. The first section of this cycleway to the east is now out for consultation. This is from Worcester St in town to Linwood Park at Linwood, with construction expected to start in mid-2016. A significant difference from previous consultations is that this is the first one to involve a Neighbourhood Greenway treatment. Unlike previous routes with separated cycleways or shared paths, a neighbourhood greenway provides a quiet, low-speed, low traffic volume route on-street. In practice, the aim is for a 30km/h speed environment and traffic volumes comfortably below 2000 vehicles/day. While the existing route isn’t bad already, a number of tricks are proposed to make it even better. OK, let’s have a look at the plans; there’s a lot of details to take in. 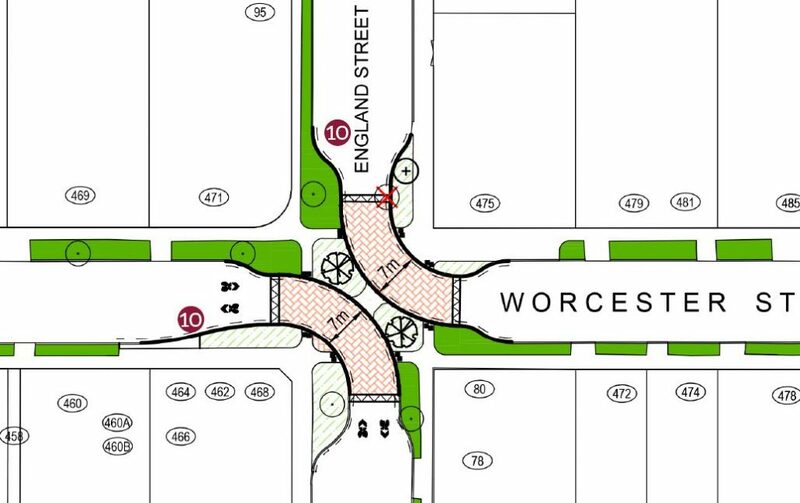 The project starts at the Fitzgerald Ave intersection with Worcester St (central city works will be done as part of An Accessible City programme), and immediately the biggest trick to reducing traffic volumes is to block through-access along Worcester St by motor vehicles. Instead, only pedestrians and cyclists will be able to cross over Fitzgerald Ave (via signalised crossings); all other traffic will have to go left-in/left-out. This reinforces the fact that Gloucester and Hereford Sts immediately parallel to this route are designated the main collector routes for traffic in this area. Worcester St is then treated with a series of raised platforms to slow down the remaining traffic; bikes get to go around the outside via bypasses. There are also “sharrow” markings proposed to help indicate to motorists that cyclists will be there too. Trials of these elsewhere around the country have found that they have worked well and even provided a slight calming effect on traffic speeds. I would have quite liked to have seen some use of central planted islands too, to help break up the continuous sight-lines down the street (see image above) and discourage speeding traffic even further. At Stanmore Rd, cyclists approaching on Worcester St will get a separated cycle lane with their own traffic signal phase to cross over the intersection. There are also cycle lanes on the Stanmore Rd approaches, where it can tie in with the future Linwood Village Master Plan works. The cycleway route leaves Worcester St at England St when it veers towards the south. Here another traffic-reducing feature has been added, with the introduction of a “diagonal diverter” that essentially cuts the intersection in half for motorists (who are forced to go around the corner) while still allowing bikes and pedestrians to go between all street legs as desired. It’s interesting to ponder whether the route should have continued on to Tancred St instead, where the diverter kerbing could have also helped to create some additional parking and seating around the café at that intersection and make it more of a local community hub. The route heads south across Hereford St to Cashel St, with motorists restricted to only left-in/out turns due to solid medians while cyclists can continue straight ahead through the middle. The image below gives an approximate idea of how it will look; again, lots of use of textured surfaces to also slow down everyone. At Cashel St the route then resumes east towards Linwood Ave. The intersection layout seems a bit odd here because there is a cycleway crossing north-south, even though the main cycle flow will go around the corner. They will need good signs and markings to ensure that people know where to go. Perhaps a more intuitive option would have been to run the route across Cashel St and then swing it into Buccleugh St instead? England/Cashel intersection – but the cycleway turns here? Because Cashel St is a bit busier than the rest of the route, separated cycle lanes on each side have been proposed along this section (although there are quite a number of driveways to cross over too). The consultation documents are pretty vague about exactly what will be used as the separators; perhaps they could try something like Auckland’s Beach Rd Cycleway. To fit everything in OK, on-street parking has been removed from many sections of the street, with the cycleway going behind the remaining parking areas. The last on-street section sees the cycleway turn down Clive St. Again, there is a slightly complex intersection treatment to limit the movements of motor traffic to left-in/out while providing a safer crossing option for bikes. Clive St turns around the corner into Marlborough St, which gets you all the way to Aldwins Rd. Throughout this section, there are various sharrows, raised platforms, narrowings and bypasses to again reinforce a safer street environment for cycling on, and hopefully discouraging some traffic from using the route as a short-cut. 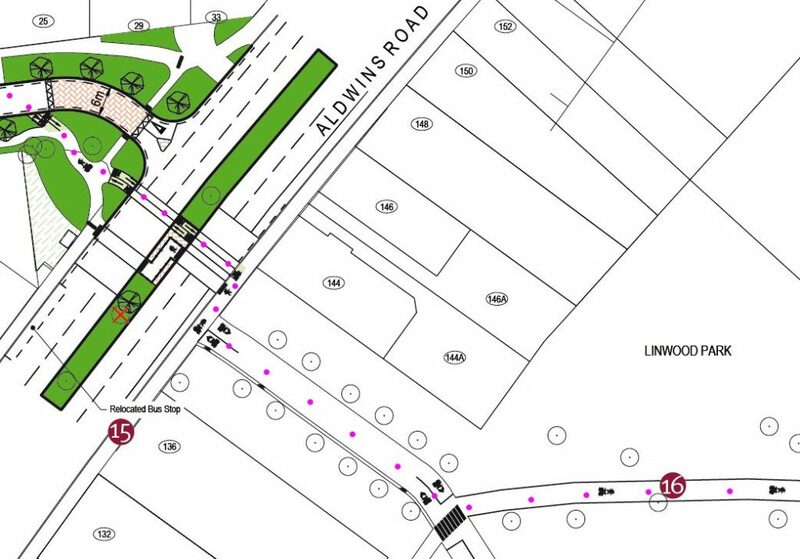 To cross busy Aldwins Rd, a new signalised intersection will be provided. As is becoming standard practice on dual carriageway roads, the cycle crossing will cross the entire road in one phase while pedestrians will cross in two phases. Like the Little River Link, the trick will be to ensure that pedestrians are going to the correct crossing. The cycleway enters Linwood Park along the access road to the temporary earthquake housing village. It’s a quiet enough route to use for biking too (presumably when the housing goes one day, they’ll just keep it as a pathway), although the sharp zigzag at the entrance is annoying and probably could be eased. Once past the accessway, cyclists will be able to use a newly widened 4m-wide shared path in Linwood Park, with improved lighting too. The final section through the park comes around to the existing signalised crossing of Linwood Ave at Chelsea St near Eastgate. Unfortunately the planned path alignment seems unnecessarily sharp as it goes “around the bend” – surely the curve could be more direct? Overall this looks like a great improvement to this route, with only a few minor design niggles. Although it is touted as creating a low-speed environment, it is interesting that there is no specific mention of introducing a 30km/h speed limit along the route at the same time; this would seem like an obvious component of the overall package. The lack of more obvious traditional cycleway facilities for much of the route, and the twists and turns that make up this route, mean that destination/route signage will also be of more importance (both for those going along the cycleway and for those joining it from side streets). So it will be important to provide this at the same time as the route is created. I also can’t help wondering whether the best route from Worcester St to Aldwins Rd has been chosen; for example, taking bikes along Buccleugh and Wellington Sts instead, or getting to Cashel St via Tancred St instead. What do you think of the proposed cycleway plans? I’d suggest putting some low plantings on some of the islands to further highlight them. As for fire engines, that’s a red herring – the grid nature of the network means that there is always an alternative way in not too far away (if any longer at all). I don’t like the look of the ‘chicanes’ that they are proposing for cyclists on the sides of the speed humps in the first photo. I assume the raised kerbing is to keep parked cars away, but it looks like it would be fairly tricky to manoeuvre around on a bike, especially if/ when the route gets large volumes of cyclists. 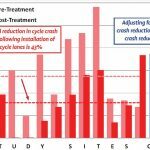 It looks like they would become a danger and an annoyance to cyclists causing unnecessary reduction in speed and delays and clashes in heavy cycle traffic. If faced with this, I think I would just ride over the speed hump if there were no cars as it would be easier. I’d prefer less vegetation and a straighter path for cyclists. They probably could be made smaller and set slightly further back to improve riding lines. But the beauty of low-speed/volume greenways is that, if you want, you can just go through the central bit instead – cycle lanes aren’t mandatory. I wish I still lived in Christchurch. So much cool cycle infrastructure going in. You guys are so lucky!